Five Pro Tour Top 8 appearances ... Won 2008 Pro Tour Player of the Year ... 17 Grand Prix Top 8 finishes, including back-to-back wins at St. Louis and Hiroshima in 2006 ... Finished in Top 5 of the Player of the Year race five times since 2005 ... One of six players with more than 400 lifetime Pro Points ... 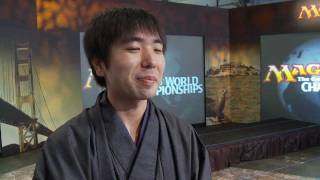 Travels the world for all major tournaments, broadening the Japanese Magic community. Shuhei Nakamura first qualified for Pro Tour New Orleans in 2002 but did not attend due to the financial costs. He qualified for the next Pro Tour in San Diego and managed to play in a handful of events over the next few seasons before finally stringing one event into the next with a Top 50 finish at Worlds in San Francisco at the end of the 2004 season. That year he teamed with Tsuyoshi Fujita and Kenji Tsumura to form one of the greatest Nationals teams to ever play at Worlds. Looking back on his first trip to the Pro Tour, Shuhei reflected on a career that stretched across two different eras in terms of how Japanese players performed and were perceived on the Pro Tour. "I didn't make Day Two. This was when Japanese didn't do well at all on the Pro Tour. I wasn't disappointed or upset," Nakamura recalled of playing at Pro Tour San Diego 2002. "What I took home from that first Pro Tour was the feeling that it was an obstacle I wanted to someday overcome. One other thing I remember from that first Pro Tour was that I met someone I thought was really, really good―Eugene Harvey. Although now that I think about it, that was right around the time he debuted on the Tour as well." Things were changing for Japanese Magic players. Tsuyoshi Fujita had already made the finals of a Pro Tour and at Pro Tour Venice Akihiro Kashima made the Top 8 while Masahiko Morita, Masashiro Kuroda, and Katsuhiro Mori were winning the Masters Series. Following his performance at Worlds in 2004, Nakamura had his breakout season on the Pro Tour kicked off by a second-place finish at Pro Tour Columbus—a Top 8 that featured three Japanese players—and another Top 8 to close the season at Worlds in 2005. It was the year that Japan swept the event held in Yokohama, winning the World Championship, the Player of the year title, and the World Team Championship. "I think the reason Japanese players were able to blossom the way they did is we were paradoxically able to take advantage of the fact that we were held back for so long by our geographic and linguistic distance," posited Nakamura. "It took a while, but eventually Fujita and then Kashima made Top 8, and my impression is that they primed everyone else. After that, players who we Japanese had known for a long time were capable but who were unknown outside the country started racking up Top 8s." To the surprise of exactly no one, Shuhei was the leading vote-getter in his first year of eligibility. With his five Pro Tour Top 8s, more than 400 lifetime Pro Points (and counting), and 2008 Player of the Year trophy the induction may not have come as a surprise, but it did not mean Shuhei wasn't nervous while waiting for the votes to be tallied. "I thought that if I didn't get in this year, I never would," said an extremely happy Nakamura. "When I learned I had been inducted, I guess I felt relieved more than anything else. It didn't help that all my friends were giving me a hard time over it." To say that Shuhei is an active player is the height of understatement. He has spent virtually every available weekend for the past few seasons chasing down Pro Points and locking up Level 8 after Level 8 status in the Pro Players Club. He admitted that his enshrinement in the Hall of Fame could coincide with a more relaxed travel schedule but explained that he was already considering that. "I was already thinking about changing my approach to the Pro Tour, but now that I am in the Hall of Fame, I suppose it will change," said Shuhei before adding that he still had some unfinished business that was driving him: "Winning a Pro Tour." Shuhei looked back to the day in 2005 when he was sitting in the audience at Worlds when the first Hall of Fame class was inducted. Later that weekend, he would add the second of his five career Top 8s, but at the time a spot in the Hall of Fame next to the likes of Jon Finkel seemed a long way away. "Ten years ago, I never would have imagined this day would come," admitted Shuhei. "Six years ago, I realized it might someday come but it would be a long time in coming. Three years ago, I made it one of my goals. Entering the Hall of Fame is one of the end posts of my Magic life, and I hope it will be one of the better achievements of my life." In becoming the second Japanese player to be inducted into the Pro Tour Hall of Fame, Shuhei wanted to thank the person who paved the way for him to get there: the first Japanese player to do so. "I would have to thank Tsuyoshi Fujita," said Nakamura. "His influence has been a major reason for me continuing Magic over the years." Made the finals of the Invasion Block Constructed Grand Prix Kobe in 2001 to start his professional career. Made three Grand Prix Top 8s that season, including a Team Grand Prix in Nagoya. He made his Pro Tour debut in San Diego 2002 and requalified periodically over next couple of seasons. Was a member of one of the best Nationals teams of all time in 2004 when he was flanked by Tsuyoshi Fujita and Kenji Tsumura at Worlds in San Francisco. Finished Top 50 at Worlds 2004, and from there his career went into overdrive, including two Top 8s the following season. Has made the Top 8 of a Pro Tour five times in his career and racked up more than 400 career Pro Points, one of only six players to reach that total. Earned the nickname "Snowmaster" when he won Coldsnap Limited Grand Prix on back-to-back weekends more than 5,000 miles apart. Has finished in the Top 5 of the Player of the Year race every year but one since 2005, including winning the title in 2008. Has posted 17 Grand Prix Top 8 in his career—the fourth most Top 8s in history—and has three wins. Has traveled relentlessly for Magic for the past half decade, hardly missing any Grand Prix events no matter how far he had to travel. Instrumental in building key relationships between the Japanese Magic community and players in North America, South America, and Europe.